Thanksgiving is a mere two weeks away! No need to freak, I've got your back with this easy, breezy, gluten-free, vegan, and virtuous wild rice, leek, and mushroom stuffing. Most stuffings tend to be heavy on the bread and the bloating, but this wild rice and meaty mushroom alternative will leave you satisfied and healthily nourished. Whether you are hosting a traditional Thanksgiving or a vegan vegfest, this stuffing will fit in with any holiday menu. Wild rice is a fantastic grain for a fall and festive meal. It is hearty and durable and loaded with nutrients. Technically it is not rice, but a semi-aquatic grass native to North America. Wild rice is higher in protein than other whole grains and contains fiber, zinc, niacin, phosphorus, folate, and magnesium. Umami-rich mushrooms and walnuts make this stuffing substantial and filling - perfect as a hearty side or a vegan main. Instead of cooking the rice in water, I used robust, flavorful mushroom broth from Pacific Foods. Pacific Foods broths have been my go-to alternative to homemade broths for years. Pacific Foods is dedicated to sourcing simple ingredients cultivated through sustainable practices. The broths are certified organic, naturally gluten-free, and contain minimal ingredients. The mushroom broth contains water, mushrooms, sea salt and garlic, thats it. To get into the festive holiday spirit, I am participating in a stuffing showdown where some fellow bloggers and myself are "going at it" for the best stuffing! What's in it for you? Vote/comment on your favorite stuffing on the Pacific Foods Facebook or Instagram page and you have a chance to win a selection of Thanksgiving-themed Pacific products i.e cranberry sauce, pumpkin, or broths aka all the essentials for your holiday meal. A grand prize winner will receive a Thanksgiving turkey raised on farms sustainably managed by Pacific Foods’ owner and a selection of Thanksgiving-themed Pacific products. Contest ends 11/11 so get voting! In a dutch oven over medium heat, warm the olive oil. Add the leeks, celery, and a pinch of salt, and sauté until softened, about 5 minutes. Add the rice and toast for a minute. Add the mushroom broth and bring to a boil. Cover, reduce to a simmer, and cook for 40 to 50 minutes, or until the liquid is absorbed. If rice is cooked but some liquid remains, drain. Transfer rice to a large bowl. While the rice cooks, prepare the mushrooms. In a large skillet over medium heat, warm 2 tablespoons olive oil and the minced garlic. Add the mushrooms, thyme, and a pinch more salt and pepper. Cook, stirring occasionally, until nicely browned, about 12 minutes. Add more olive oil, if needed. Transfer to the bowl with the rice and add most of the parsley, reserving some for garnish, lemon zest, and toasted walnuts. Mix well to combine. Preheat oven to 350 degrees. Transfer the rice mixture back into the dutch oven, cover, and bake for 25 minutes. Uncover and bake until lightly browned, about 10 minutes more. Finish with remaining parsley and serve. This post was created in partnership with Pacific Foods. 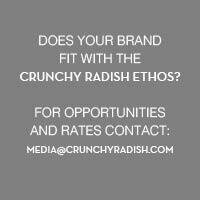 Thank you for supporting the brands that support Crunchy Radish.